Recent press headlines screamed that some crime is rising nationally, especially violent crime. What is the situation in our neighbourhood and county? We are overall a low crime county. But we have hotspots. Ludlow is mid-ranking on the crime scale with the northern towns experiencing higher crime rates, especially in their central districts. Deeply rural towns like Church Stretton and Clun are so much quieter. Reported crime is increasing at half the rate in Ludlow compared to Shropshire as a whole, and at just a quarter of the national rate. Any level crime is unwelcome and there are some troublesome hotspots around the county. But overall, Ludlow and Shropshire remain safe places to live. Nearly 2,000 crimes in Ludlow have been reported to the police over the last three years, more than 50 crimes a month. There were 60 crimes reported in Ludlow every year for every 1,000 people that live here. 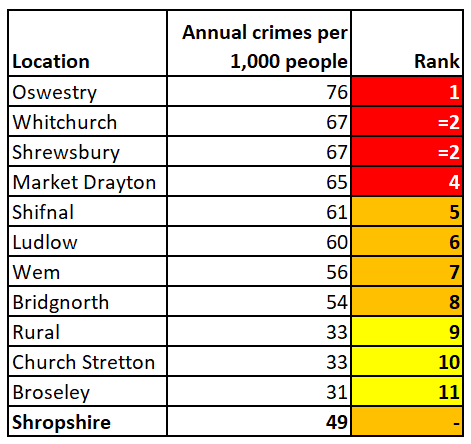 That’s above the Shropshire average of 49 crimes but way below Oswestry, which clocks up 80 crimes a year per 1,000 people. Clun has a crime rate of just 27, proving it truly is one of the quietest places under the sun. This is the first of a short series of articles looking at crime across the county and in Ludlow in particular. It is based on police crime data. We know from the National Crime Survey that not all crimes are reported to the police. That means the true rate of crime is higher than reported in this article. More complex than this, national surveys show that people are experiencing a much lower level of crime. Notwithstanding this, the police data does gives a basis for comparing crime rates and type of crime across the county. From mid-2015 to mid-2017, 1,948 crimes were recorded in Ludlow (excluding antisocial behaviour). In Shropshire, there were 45,725 crimes recorded. That means that the police are dealing with more than 14,000 crimes across the county, including around 650 crimes in Ludlow, every year. Ludlow is in the middle band for reported crime. It experiences double the crime rate of smaller towns, villages, hamlets and farms but has a lower crime rate than the most of the county’s northern towns. We need to put this data in perspective. In 2017, there were 83 crimes for every 1,000 people across England, 67 in West Mercia and 49 in Shropshire. That makes our county a relatively low crime area. Looking in more detail at Shropshire, the five council wards with the highest crime rates and the five with the lowest are shown below. (The full table is here.) Again, the northern towns top the table. Ludlow North, which includes the town centre, is in sixth position but it has only one third of the recorded crime rate of Quarry and Coton Hill in central Shrewsbury. As you can see, the area on the east of Ludlow town centre is in the top five, though it has under half the recorded crime rate of that in the centres of Shrewsbury and Oswestry. I will be writing more on the distribution of crime in Ludlow shortly, including publishing detailed maps of where crime occurs. Nationally, the reported crime rate grew 23% over three years. In West Midlands it grew 14%. Is reported crime increasing in our county? Yes. Around 2,000 extra crimes were reported in the last year compared to three years ago. That’s a 15% increase. The trend in Ludlow is less pronounced. Reported crimes are 7% higher over the last year compared to three years ago. This is the first in a series of articles examining crime patterns in Ludlow and Shropshire.
. This article uses data from July 2015 to June 2018. It does not include data on fraud and computer misuse, which has dropped substantially. Neither does it include antisocial behaviour, which I’ll write about separately. It is recorded crime and some upward trends may be due to easier reporting, for example through 101, more consistent recording by the police and changes to police reporting standards. Police recorded crime has been increasing nationally, while the Crime Survey for England and Wales suggests that people are experiencing less crime. This is not a paradox but due to some higher volume crimes falling fast while less common, but often very serious crimes are increasing. See also Full Fact, which explains some of the complexities of interpreting this data.
. Ludlow is defined as Lower Super Output Areas (LSOA) Shropshire 038A-038I (the town area). Shropshire is the unitary authority area and excludes Telford and Wrekin.
. Towns with more than 4,000 people. 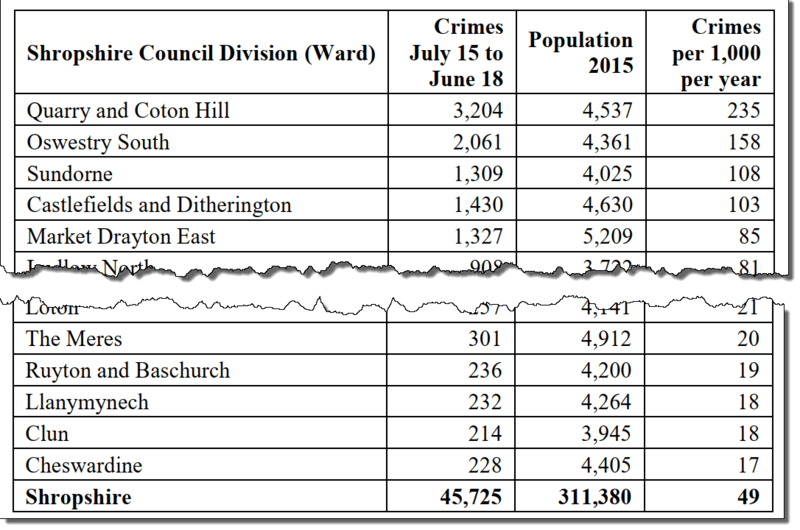 The details of this ranking will vary from year to year and small difference in overall crime rates are insignificant, hence my averaging the crime data over three years.
. Source: ONS – Crime in England and Wales: Police Force Area Data Tables.
. Astute readers will note that the crime rate for Clun is lower in this table than I quoted above. This is because this table shows Clun Division, which includes extensive rural areas and the headline number I used in the introduction to this article is for the smaller area (LSOA) covering Clun town.
. The three years to end March 2018, not June 2018 as used in the rest of the article. See Note 1 for an explanation of the complexities of interpreting this data.
. It has not been possible to correct for population growth in Shropshire as the latest small area population estimates are for mid-2016.